The high-definition ViP722? DVR has all of the features of our award-winning ViP622? DVR, but with even more recording capacity. The ViP622 DVR? is cutting-edge TV sophistication with a digital video recorder and high-definition receiver that supports two TVs. It?s another example of DISH Network setting the standard for better TV. The ViP211 receiver features one tuner for veiwng DishHD programming on one television. 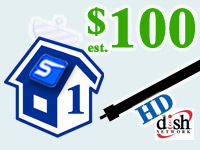 Order private, 1 Room Dish Network Hi- Definition installation from a local, SatHookup Network installer. Get custom installation and avoid extending your contract by hiring an independent installer to work on your Dish Network satellite system. Free DishHD programming for 6 months! DirecTV? HD DVR is "mediocre"
High Def. HD. High-Definition. HDTV. For true HD, you need an HD television set, engineered specifically to receive - and deliver - a high-definition picture that is deeper, clearer and more life-like than with standard definition. HDTVs are available in consumer electronics stores and have never been more affordable. Add entertainment made just for the HD experience. DishHD has the greatest quantity and variety of HD content and offers the industry's most extensive HD line-up - providing twice as many national HD channels as any other provider. Go!. Bring it all home with a receiver designed specifically for HD. Make the experience even better with a model that includes a built-in DVR (digital video recorder) to pause live TV and record your favorite shows in high definition. DISH Network offers a variety of high definition television channels such as theater-quality movie channels, educational and nature programming, pay per view HDTV satellite movies, and HDTV satellite broadcasts of special events, including concerts, boxing matches and professional sporting events. SatHookup makes it easy to receive high definition satellite television from dish network with DISHHD? Entertainment Packages which includes ESPN HD, Discovery HD Theater?, TNT in HD, HDNet and HDNet Movies all for one low monthly price. If you order now, we will throw in a HD receiver - absolutely free!